Japanese method for workplace organization. The five S’s are seiri, seiton, seiso, seiketsu, and shitsuke or sorting, straightening, shining, standardizing, and sustaining. 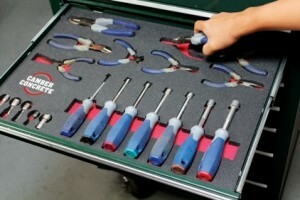 The picture shows a 5s organized tool system. Every tool has it’s place and if it is not there it is obvious.